We make commercial waste disposal simple and effective. Our business trash services feature consistent flat rate pricing, flexible pickups and a highly-trained team of industry experts. Whether your organization needs one front load bin or several, call us for reliable and easy-to-use commercial dumpster service. We manage trade waste disposal for businesses big and small. Find your industry below to see suggested dumpster sizes. Don’t see your organization listed here? Give us a call at 844-444-DUMP – chances are we still have a container to handle your waste stream. Our commercial dumpster services can manage trash from any corporate setting, from budding startups to sprawling office parks. 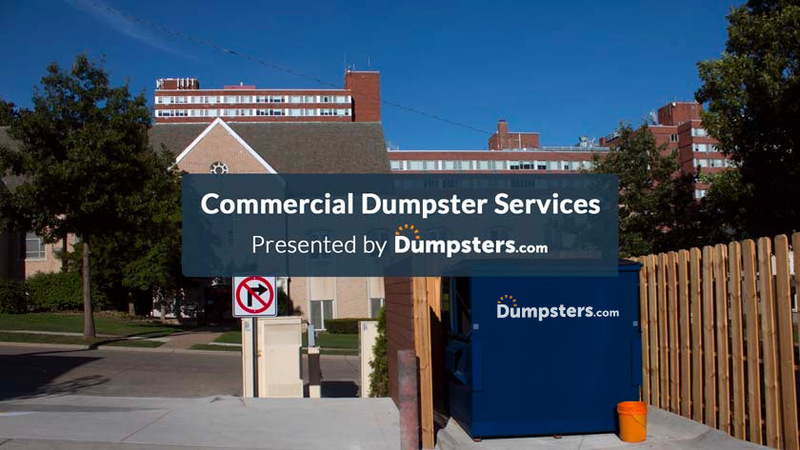 We offer a range of front load dumpsters to handle any multi-unit property, from college dorms to downtown condos. Whether you manage a neighborhood diner or a five-star bistro, you can customize your bin with locks or wheels to fit your needs. If you run a boutique hotel or manage multiple properties, just give us a call to update your pickup schedule for big events. Tired of boxes piling up? We’ll work with you to create a waste management plan for your store with the freedom to change your size before peak season. Our flexible commercial dumpster rental agreements make it easy to adjust your collection frequency during summer months. We streamline the container rental process to make trade waste disposal simple. Here’s how to get set up in four easy steps. We’ll pick up the phone fast to answer your questions and set up your waste service. We’ll walk you through our front load dumpster options to find the best fit for you. Schedule weekly, biweekly or monthly garbage pickups based on the needs of your business. If your needs ever change, just give us a call and we’ll adjust your service. The typical dimensions of our commercial dumpsters vary based on the total volume of each bin. Use the information below to determine which option is the best fit for your business or organization. Dimensions and available sizes may vary by location. We make it easy. When you set up trash pickup for your property, we’ll package all of your disposal costs into one simple flat rate price. This way, you’ll always know what to expect when the bill comes. Unless you request an extra service, your bill won’t change month-to-month. If you schedule an extra pickup, swap your container size or choose to add features like locks or wheels, our helpful team will review these additional costs with you. When you rent a front load bin from us, you can expect flat-rate, all-inclusive pricing that won’t change month-to-month. Our team is experienced in serving a wide range of commercial customers. You can expect continuous waste management support from a team of industry professionals. We don’t want your trash to become a headache. We give you the ability to customize your pickup schedule, select from a range of sizes and make adjustments when needed.